The degradation of wetlands and grasslands is a matter of grave concern for environmentalists, both in Nepal and across the globe. 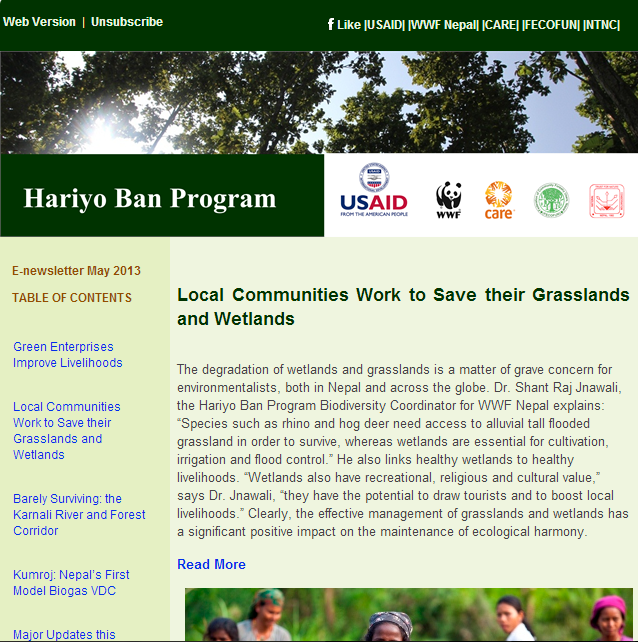 Dr. Shant Raj Jnawali, the Hariyo Ban Program Biodiversity Coordinator for WWF Nepal explains: “Species such as rhino and hog deer need access to alluvial tall flooded grassland in order to survive, whereas wetlands are essential for cultivation, irrigation and flood control.” He also links healthy wetlands to healthy livelihoods. “Wetlands also have recreational, religious and cultural value,” says Dr. Jnawali, “they have the potential to draw tourists and to boost local livelihoods.” Clearly, the effective management of grasslands and wetlands has a significant positive impact on the maintenance of ecological harmony. On the occasion of World Environment Day 2013, Kumroj VDC in Chitwan district was declared as Nepal’s first model biogas VDC by Agricultural Development and Forests and Soil Conservation Minister, Tek Bahadur Thapa Gharti. The event was also attended by a number of other government officials and a representative from USAID. Biogas plants have been installed in 1,374 of the 1,750 households in the village, making it the first VDC in the country where more than 80% of households are biogas users. It took Uttam Bishwakarma a day and a half to get to Kathmandu from Barpak village in Gorkha district. The poor condition of the roads didn’t dampen his enthusiasm – he was on his way to the Department of Food Technology and Quality Control to get approval to sell the nettle powder (Urtica dioica or sisnu in Nepali) produced in his village. Uttam felt confident that the department would give him the green light. 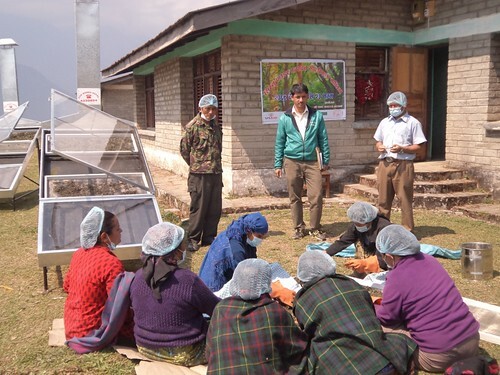 Nettle powder production in Barpak is just one example of the Hariyo Ban Program’s green enterprise initiatives. It began in September 2012 when the Gorkha-based CARE Nepal team consulted with the District Forest Office and the Gorkha Chamber of Commerce to assess green enterprise potential. “Let a female tiger in India make love to a male tiger in Nepal,” sang Bhadai Tharu, a local conservationist from Bardia. His song underlines an important fact. Like all other species, tigers too need genetic diversity in order to survive. Inbreeding reduces their chances of survival and with the added complication of climate change, how do we ensure that Indian and Nepali tigers meet? On Environment Day 2013, Hariyo Ban Program in collaboration with USAID organized a follow-up of the media workshop on environmental journalism conducted on April 22 and 23. During the media workshop, ‘Earth Matters: Changing the Lens on Environmental Reporting’, 12 journalists from prominent print, digital, and audio-visual media participated in an extensive workshop that aimed to help them link environmental stories to broader socio-political issues and connect the dots between the local, national, and global context. After the workshop, the journalists were taken to Central and Western Terai Arc Landscape (Chitwan and Bardia) to gain practical understanding of critical issues. Many of these journalists came back to produce Hariyo Ban Program inspired news and stories from the field. On World Environment Day these Hariyo Ban Program inspired stories were shared to a wider audience that included students, partner organizations and resource persons. Click to view pictures from the Western Terai Arc Landscape media field visit. Click to view pictures from the Central Terai Arc Landscape media field visit. Click to view pictures of various stages of nettle powder production. 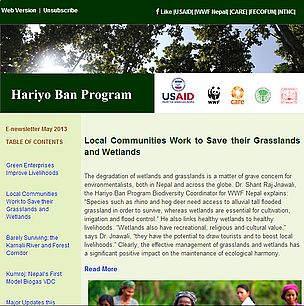 Hariyo Ban Program's green enterprise initiative. A nursery was established at Godam, Makwanpur to promote plantation in degraded forest area. Community Based Anti-Poaching Operation (CBAPO) trainings were provided and CBAPO units formed in various districts of TAL and CHAL. Dolphin monitoring training provided and survey carried out in Bardia National Park, Thakurdwara. Community-based red panda monitoring system was established in Langtang National Park and Buffer Zone. Citizen scientists training for biodiversity conservation was provided in Pokhara. Four villages in Lamjung namely Neure, Chhichu, Khanibeshi and Ghermuphant were declared as Improved Cooking Stove (ICS) Model Village on April 23, 2013. 62 metallic improved cooking stoves were provided by the Hariyo Ban Program in collaboration with the Government of Nepal's Alternative Energy Promotion Centre (AEPC) and Manasalu Community Forest User Group (CFUG). 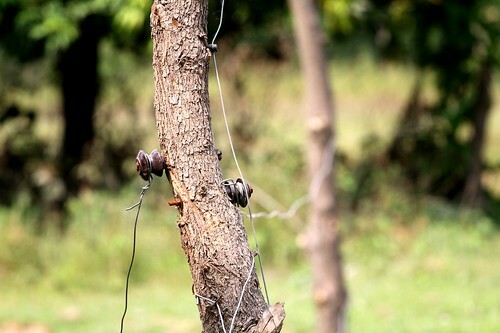 Fire lines were constructed and maintained in three buffer zone community forests in Banke. Kumroj was declared the very first biogas VDC of Nepal on June 2, 2013. Firefighting trainings and equipment support was provided to Dhodre CFUG in Gorkha, Siddhathani CFUG in Tanahu and Bhirkuna CFUG in Lamjung. Consultation workshop on drivers of deforestation and forest degradation was conducted in Sardikhola VDC of Kaski district. Rapid assessment was completed to identify vulnerable groups and sites in selected communities of Pauraha, Rautahat. Workshop on mainstreaming the climate change adaptation and disaster risk management issues in Local Development Plan (LDC) was conducted in Besisahar, Lamjung. Climate change awareness program carried out in various schools in Dhading, Banke and Kailali. On World Environment Day, names of twenty two students eligible for Hariyo Ban Program small research grants were announced. Various skill-based trainings such as livestock rearing, spice crop production, vegetable and broom grass farming, tailoring etc. were provided to marginalized community in Bandipur for livelihood improvement. Deep freezer was handed over to fish farming households in Sarangkot VDC of Kaski district to support livelihoods improvement initiative. Citizenships of 65 ultra-poor community members in Hadikhola VDC was obtained through the intervention of six Hariyo Ban Program initiated Community Learning and Action Centers (CLACs) in Makwanpur district. Gender and Social Inclusion trainings provided in Lamahi and Gadhwaha of Dang. Public Hearing and Public Auditing (PHPA) conducted in Deurali VDC. Participatory Well Being Ranking (PWBR) completed in Dhading.